There's nothing sadder in this world than to awaken on Christmas morning and not be a child. Erma Bombeck wrote those words years ago. A bit overstated for sure, since there are obviously many things sadder in this world.... but I appreciate the nostalgic spirit of what she said. Of course, someone else said, "Tis better to give than to receive".... and while that's true, it's something most of us don't really believe until we get past childhood.... until the time when we wake up on Christmas morning -- or any morning for that matter -- and the mirror and aching feet quickly remind us that we are, indeed, not a child. The other day, someone asked me what the best Christmas gift I received as a kid might be, and.... you know what? -- I can't remember for sure. Or maybe a chemistry set, that provided me countless ways of staining the rugs and annoying my big sister. I also remember getting a telescope that -- (and I never confessed this to my parents, even after I was a grown man) -- I had spotted in their cedar chest a few weeks before Christmas. But I do clearly recall the best gift I "gave".... and the picture of the kitchen cabinet attached to this essay triggered that recollection. First, let me explain the photo. That's a corner of the kitchen in the house in Georgia where I grew up. The house is currently for sale, and Paul Wolfe, a boyhood pal who still lives in Augusta, sent me the real estate flyer with pictures of the house. 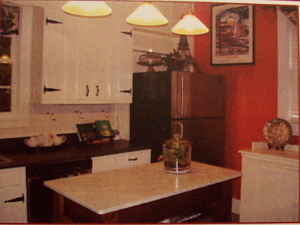 The house has been upgraded considerably since my family lived there -- (all those hanging lights and the island have been added) -- but that white cabinet next to the refrigerator looks exactly the same.... with the same hinges and handles. Anyhow.... one Christmas, many years ago, I gave my mother the gift of a plain, "greenish" mixing bowl, about the size of half a basketball, which I think I paid 50 cents for at Woolworth's. She kept it in that cabinet. She used it a lot. Even years later, when I would visit home, I would see it there. It didn't really match anything else she had. It was not an especially attractive bowl. As I got older I often wondered if she really even liked it, or if she was afraid it might hurt my feelings if she discarded it. But, as I got even older, with kids of my own.... I understood.